Cowichan Land Trust Member and Volunteer Joins TLC to “Pony up for the Point”! TLC Member and Cowichan Valley Resident, Jim Wisnia, has decided that it’s time to “Pony Up for the Point”. 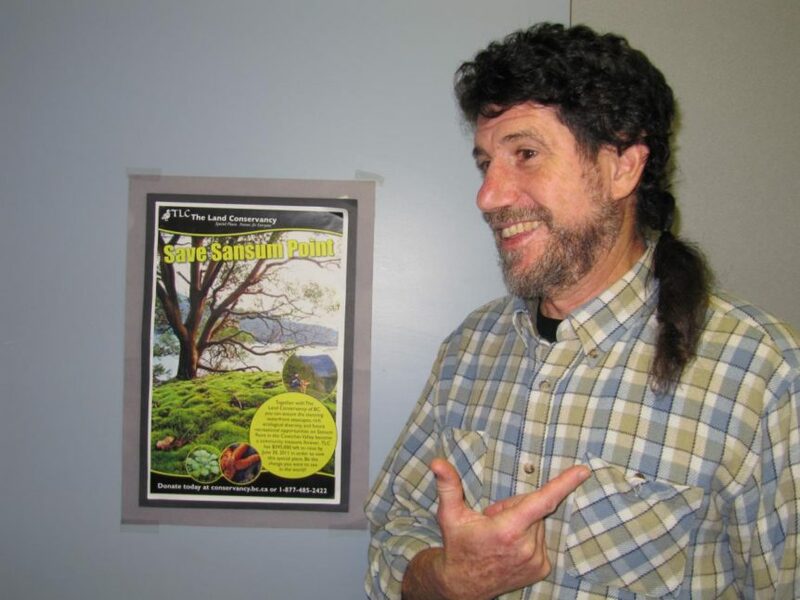 To assist with the campaign to raise funds for Sansum Point, Jim has pledged to cut off this pony-tail once he has raised $5,000. Jim first began growing his hair a little longer when he found it kept his neck warm while working outside at the North Vancouver Outdoor School. His current pony-tail, which is about 12 inches long, has been in the works for the last couple of years. In the back of his mind he always thought he might be able to use it for a fundraiser. As someone who loves a good hook, “Pony up for the Point” was a perfect fit. Jim and his wife Lyn were happy to donate to help save Sansum Point when the opportunity first arose in early 2011. As long-time TLC Members, they love to get out and enjoy nature and have a deep appreciation for the important natural and cultural values of Sansum Point. Through his endless enthusiasm Jim hopes to inspire his friends and many others to Pony Up for the Point. The highest donation will even have the option to be the one to cut off the pony-tail! TLC is forever grateful for Community Action Heroes like Jim. The inspiration, awareness, and funds raised through their efforts make a lasting difference for B.C.’s special places. Join Jim and Pony up for the Point today! When the property came up for sale in 2011 TLC secured an option to purchase the site, valued at $1.85 Million, and partnered with the Cowichan Valley Regional District and the Cowichan Land Trust. After an intense 5 month fundraising campaign, the property became a Cowichan Valley Regional District Park in early September. TLC and the Cowichan Land Trust have carried on with fundraising to fulfill their financial contribution and thanks to this generous gift only $380,000 remains to be raised.